Meghan Ritchie claims she’s held nearly every odd job in New York City — a daunting accomplishment, for sure. At 18, she moved to the city to attend college to study theater. To support herself, she did everything from assisting a Broadway actor to knocking on doors asking and for donations to clean up toxic waste sites. And she waited tables — a lot of tables. When she took on another side gig in 2007 — selling doughnuts on her front stoop — she never expected it would turn into the national, Starbucks-recognized business she owns today. Now 35, Ritchie has always enjoyed baking, so back in 2007, she decided to capitalize on her doughnuts and start a business. She baked them in her apartment kitchen with her roommate. Then, once a week, they’d set up shop on the front stoop. They didn’t even use a table, instead displaying the trays of treats on the stairs. About two years in, Ritchie decided she no longer wanted to make doughnuts, which went stale quickly. After a baking hiatus, she returned to the stoop in the fall of 2011 with scones and hand-pies (moon-shaped pies baked with whole fruit). 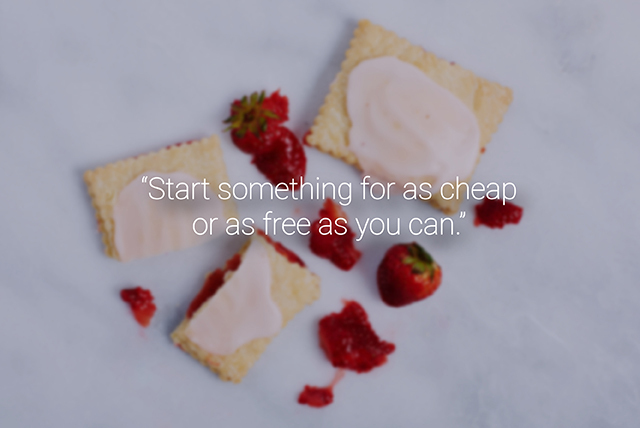 These evolved into Megpies, she says — fancy, homemade Pop Tarts filled with preserves and topped off with icing — inspired by her grandma. “That’s where this all really started,” Ritchie says, referring to her beloved front stoop. In early 2012, Ritchie became an assistant at a jam shop. The gig involved slicing, dicing and zesting fruit. 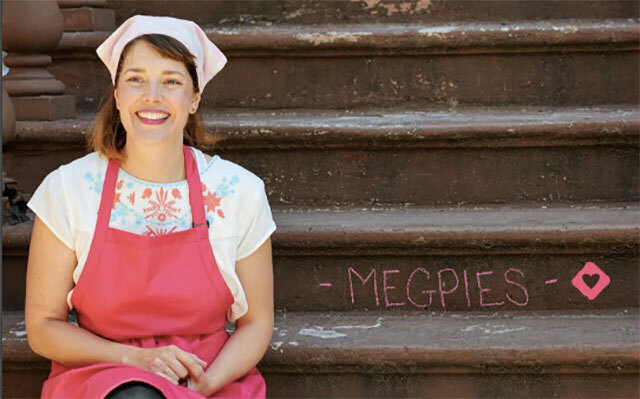 Her boss had seen Megpies listed on Ritchie’s extensive resume and asked her to sell her scones and tarts alongside the jams on her first day, which she did at a local market. Ritchie also started selling her products to local cafés — the ones she passed on her five-mile bike commute to the jam shop each morning. She popped into these shops, gave the owners a rundown of her infant business and left a plate of treats after a “just think about it” proposal. From her apartment kitchen, Ritchie began churning out about 100-150 scones and 300 tarts a week. She used the jam shop kitchen to prep the dough for the tarts, then toted it all back home at night to bake. “I would pile everything on the back of the bike — like 90 pounds of frozen dough,” she says. She’d wake, bake, then make bicycle deliveries as she headed back to work at the jam shop. As her business grew, Ritchie’s boyfriend, Paul Jones, helped her in the apartment kitchen, “as a good boyfriend would,” Ritchie says. The kitchen soon became too small. Around July 2012, the couple found a restaurant with a large kitchen used solely for event catering. It was rarely used, so Ritchie bartered: She’d dedicate 10 hours a week to help the pastry chef in exchange for use of the space. Even though she was able to drop her jam shop gig, Ritchie found herself working ridiculous hours: Wake up at 1:45 a.m. and head to the restaurant to work on Megpies and the restaurant’s desserts — then return home around 8 p.m. to sleep and repeat. During this time, she produced thousands of tarts a week, so Jones stepped in to make the morning bicycle deliveries. He also began selling the products to more people and businesses. “He’s wonderful with people in a way I am not,” Ritchie says. Once again, the tarts took over the space, so they hunted for something even bigger. Through connections, Ritchie and Jones found a kitchen full of equipment that was no longer being used by the tenants. As long as Ritchie and Jones paid utilities, they could use the space. Cue more growing pains. Caught between taking out a loan for a larger space (think: NYC rent) and co-manufacturing, Ritchie opted for the latter. So, for the first time since the business started, Ritchie paired up with a third-party professional baker whose team produced and packaged Megpies. This took a little bit of the baking burden away from Ritchie. Soon, Megpies found itself teetering on a big break. A woman Jones knew from elementary school worked at QVC. She connected the couple to her associate, who helped them scale the business to meet the anticipated demand from TV shoppers. Unfortunately, the process just didn’t work out for Megpies. However, the associate was also connected with Starbucks and mentioned a possible partnership. “Finally he called, and said ‘OK, we’re a go,’” Ritchie remembers. Megpies fit the description of a small, locally-born business, which Starbucks was pushing to pair with. Thus, the partnership was born. Ritchie says she’s been pleasantly surprised. The folks at Starbucks have been willing to help Megpies grow at a much faster pace than Ritchie ever anticipated. The company provides resources and answers any questions that pop up. Megpies still operates independently of the big coffee mogul. Starbucks is just giving them the platform to sell — and a whole lot more shelf space than any local shop. Megpies also began operating in an additional co-manufacturing space to comply with federal food-safety protocols. “Again, we found somebody who knew somebody,” Ritchie says of the family-owned bakery. The big, national launch was July 12. That’s when brown sugar and strawberry Megpies suddenly appeared on nearly 7,500 company-owned Starbucks coffee shop shelves. Now, with more than 7,500 accounts, Ritchie projects Megpies will make 10 times the money it made last year when they only had about 70 accounts. “It’s been an interesting learning curve,” she says. Although Ritchie isn’t baking anymore, she’s still just as involved in Megpies as she ever was. She handles all of the production logistics — from the baker and transportation to the storage and retailer. Ritchie’s biggest pieces of advice: Don’t worry about getting everything perfect — and don’t sink a lot of money into anything just yet. And Ritchie, who was at first hesitant to enter those small coffee shops, now encourages people to not shy away from opportunities thrown at you. And take advice. “If you don’t know how to do something, ask,” she says. 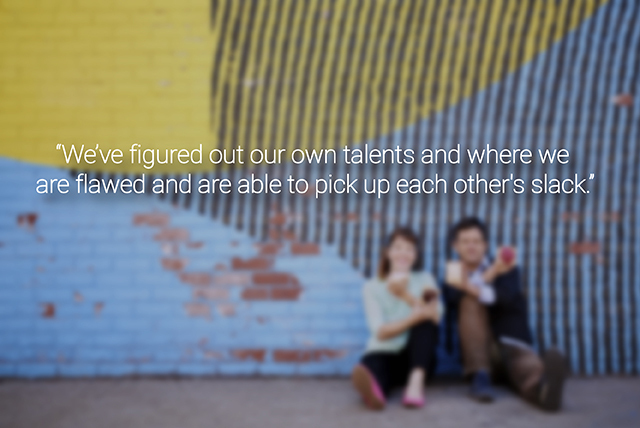 Your Turn: Have you turned a side gig or passion into a career?